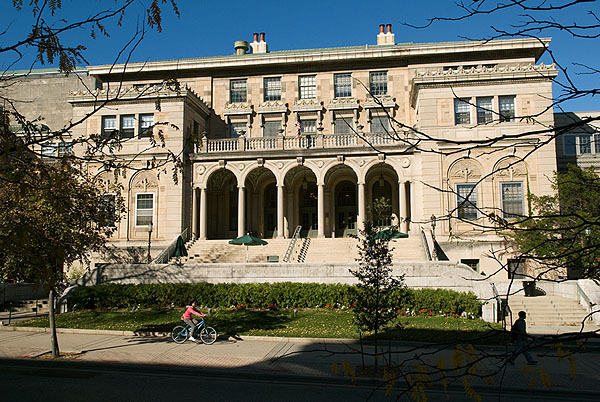 The conference opening reception, meals, and registration will be held at the Memorial Union. As one of the most beloved and historic destinations on campus, Memorial Union is the place to come socialize, relax, study, eat, and enjoy all the beautiful sunsets and lake views that Madison has to offer. Since opening its doors in 1928, it has offered a variety of social and educational activities for UW students, faculty, Wisconsin Union Members, and the Madison community. Among its many treasures, the building houses a 1,200 seat theater, Strada Italian Cuisine, Carte Soups & Salads, the Daily Scoop Ice Cream, Badger Market, Peet’s Coffee, Der Rathskeller German-Style Tavern, Wheelhouse Studios, Wisconsin Hoofers, various art exhibits, and plentiful study space. Situated on the shores of Lake Mendota, the classic architecture of the building boasts a picturesque lakeside view as well as a terrace with 600 colorful sunburst chairs – the perfect spot for an afternoon snack in the summer. One of the most cherished parts of the Memorial Union is the Terrace. The Terrace functions as a great place to enjoy a beautiful day, grab a beer with friends or colleagues, sunbathe or swim off the pier, and catch one of Madison’s stunning sunsets. When the Terrace was first envisioned in the fall of 1928, it was thought to serve as a fun meeting place, a sort of “undergraduate playground.” Today, its mission and purpose of being an enjoyable gathering spot for students, parents and alumni continues to improve. After the reopening in early 2016, the Terrace expanded seating, extended grilling, increased shoreline and lakefront views, and added additional food options. During the summer months, the Terrace hosts a “Terrace after Dark” music and film series which is free to the public. For more information on the 2018 lineup, check out union.wisc.edu/events-and-activities/special-events/terrace-after-dark-music-and-film-series/. Conference Services and the Wisconsin Union strive to promote green conferences and events and ask our conference guests to help us in those efforts. Wireless Internet access is available to all conference participants. Upon check-in, each participant will receive a login and password which will grant access to the meeting site secure wireless network. The network is available throughout the building, including the Union Theater and outside on the Lakefront Terrace. In addition to a small computer terminal within the meeting site (1st floor), computer labs are located on either side of the meeting site (http://www.doit.wisc.edu/computerlabs/labs.asp). The computer labs are equipped for printing and copying. The Hoofer Sailing Club at the Memorial Union offers various sailing packages during your time at the conference. Please visit the Hoofer website for more information.